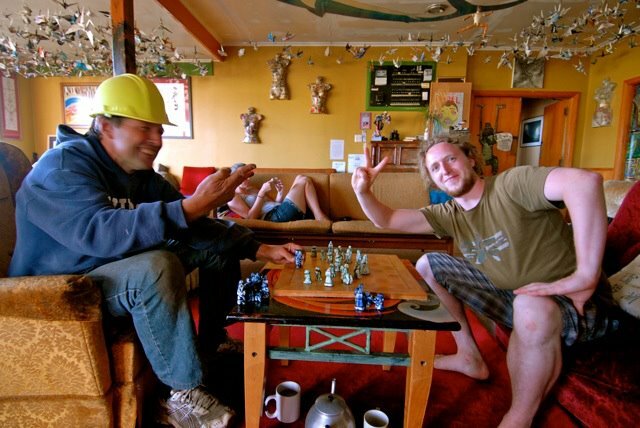 Karamea, New Zealand: Rongolian Chess Champion Andreas Diller arrived at Rongo Backpackers & Gallery in Karamea on the West Coast of the South Island of New Zealand yesterday to defend the chess title he claimed in February 2012. Diller grabbed the title and the prize of free accommodation at Rongo after cunningly working with double agents from Sweden and England, who piled the then titleholder Samson Jesus Elijah Lewis Arthur Gordon Jackson with hard liqour prior to the match. The thoroughly pickled Jackson was an easy mark for the wily German challenger, who claimed with the championship prize through rat cunning rather than genuine genius and chess mastery, but, in this gloves-off, lawless cage-fight battle of wits and intellect, anything goes and Diller was a worthy winner. Jackson will no doubt have his full arsenal of acumen on board as he attempts to overcome his embarrassment and reclaim the title he considers to be rightfully his…this is going to get UGLY sports fans! Andreas Diller (right) claims the title of Rongolian Chess Champion from Samson Jesus Elijah Lewis Arthur Gordon Jackson, who held the coveted gong for three years. Diller appeared calm and relaxed after a two-month break during which he travelled around New Zealand basking in the glory of wresting the title from resident Rongo chess aficionado Lewis Arthur Gordon Jackson (aka Samson Jesus Elijah) earlier this year. Diller was composed, comfortable as he worked the crowd and appeared to be complacently drinking heavily ahead of the rematch. In stark contrast to Diller’s confident demeanour, Jackson seemed somewhat discombobulated when confronted by Diller on the eve of the championship bout, which is scheduled for the evening of April 19 in the Rongo Chess Pavillion. 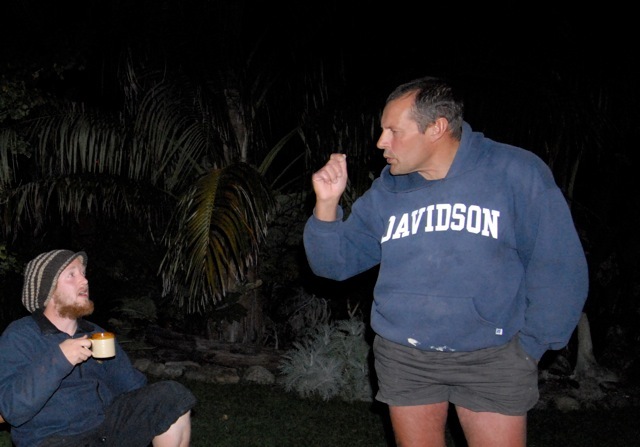 The two chess specialists confronted each other at the DJ Crap and the Big Man Blues Show at a bonfire outside Karamea Radio 107.5 FM and a heated verbal exchange ensued with much bravado and hubris shown by both title contender and defender. The competition looks HOT for the rematch with a good crowd booked in to watch the title defense…stay tuned for further details as the challenger’s gauntlet is laid before the defender. Rongolian Chess Champ Andreas Diller (with the support of the crowd) responds to taunts from Samson Jesus Elijah Lewis Arthur Gordon Jackson and said, "Who's the Champ Loser?" Fight Night is scheduled for April 19, 2012 at Rongo Championship Chess Pavillion 130 Waverley Street Karamea…doors open at 6:00 p.m. and the action starts following the singing of the German National Anthem at 7:00 p.m. Tickets available at the door. 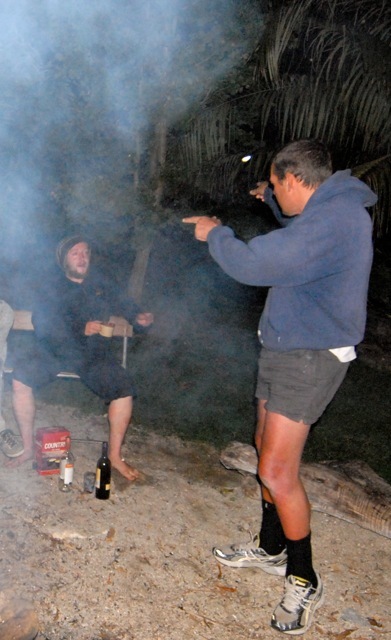 Samson Jesus Elijah Lewis Arthur Gordon Jackson responds with, “We’ll see who’s a loser pal…just be on time and make sure you’ve got plenty of tissues to mop up your loser tears…loser.” GAME ON in KARAMEA!!!!!! 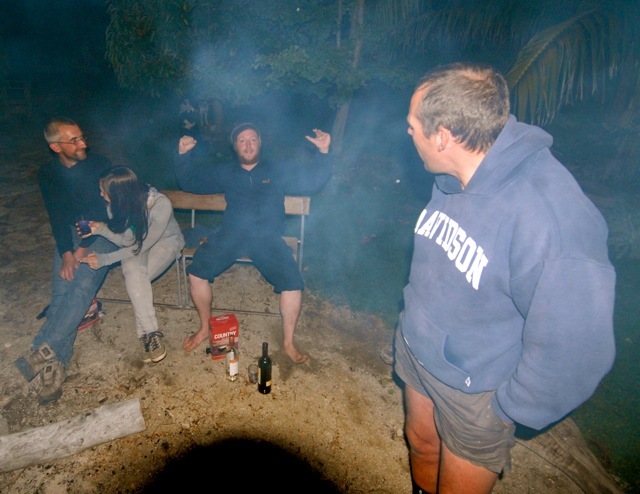 This entry was posted in Humour and tagged Challenge, Championship, Chess, Contest, Diller, karamea, Lewis, New Zealand, Rongo, Rongo Backpackers & Gallery, Rongolia, South Island, Sport, West Coast. Bookmark the permalink.